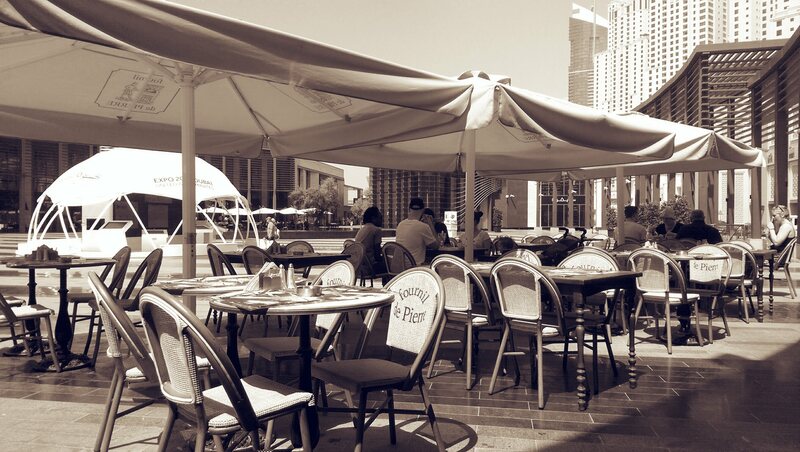 As the great winter days of Dubai come to a close in a couple more weeks, spending your weekend mornings al fresco is almost mandatory now every Friday before summer kicks in as you get forced to lock yourself in your cocoon of air-conditioned comfort for another 5 months, then breakfasts out side in April will always be remembered. From the thousands of cafes and restaurant in Dubai, I chose to take short stroll from home to The Beach Mall. 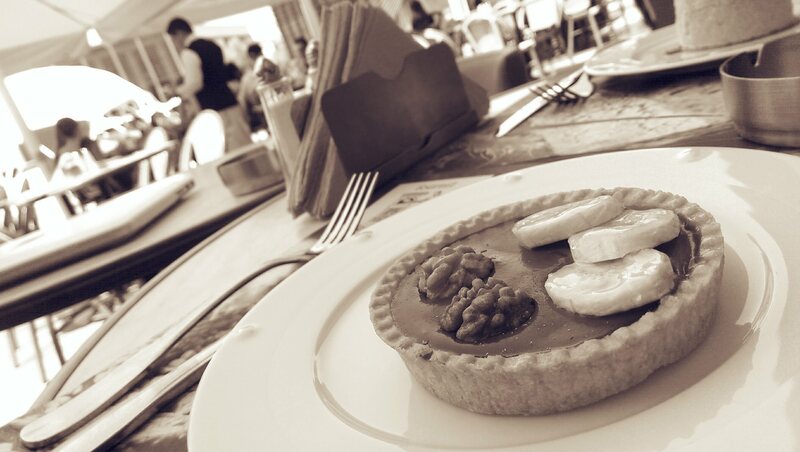 From Singaporean to Japanese cafes spread throughout the open air beach mall, I chose a French Boulangerie again, Fournil De Pierre. There’s something about French cafes that I always get attracted to even though when I was in Paris back in 2004, they really weren’t my thing. 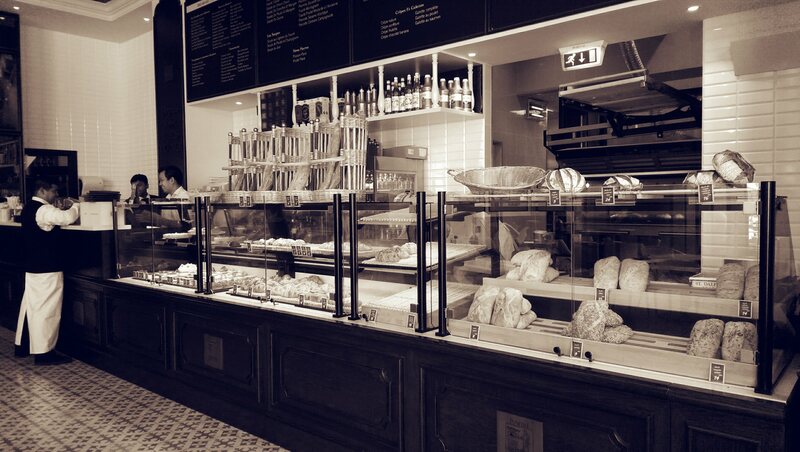 French cafes are noisy, stank of cigarettes and you can’t linger as you want like the cafes in Belgium. Or I don’t know, maybe I was always at the wrong cafe in the City of Lights. 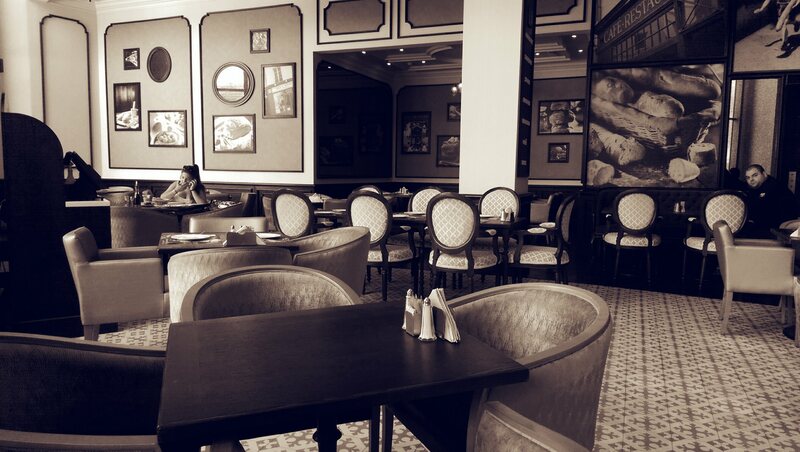 So here we are, a French cafe by the beach. It was my second time coming to Fournil De Pierre. Brought my friends couple months back here for a late night coffee and crepes. First time was a disaster since there was only one wait staff and had issues getting our orders. I don’t blame the wait staff guy, they were almost closing but not an excuse to get bad service. And anyway we sat from the farthest table outside so we were the one to blame as well . So let’s give Fournil a second chance. The atmosphere is almost like Paul, minus the crowd. Its more quiet and relaxed. I love Paul. Their coffee and desserts, plus their service. Will Fournil De Pierre be the same? Hmmm… Not quite. A love and hate relationship I must say. Interiors are great, French club chairs and high ceilings with classic mouldings and nice turn of the century flooring. nice al fresco area facing the mall’s water feature when at night the view and lighting effects are better. One thing I noticed is when sitting outside, you hear the cries of the babies and toddlers echoing the from neighbouring restaurants PF Chang’s and Cheesecake Factory. A little minor issue but that should be fine. Blame the parents, not the kids. I already had a quick breakfast of eggs and ham at home so it was time for a little dessert and coffee post breakfast. 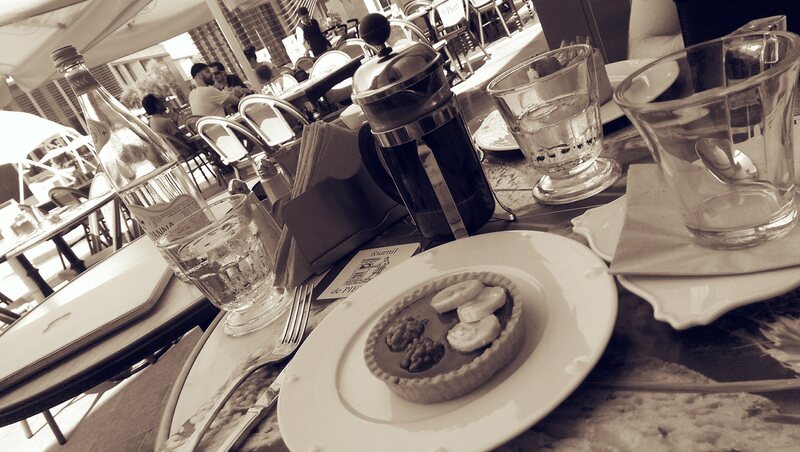 I chose to go for the classic French press and a chocolate banana tart. 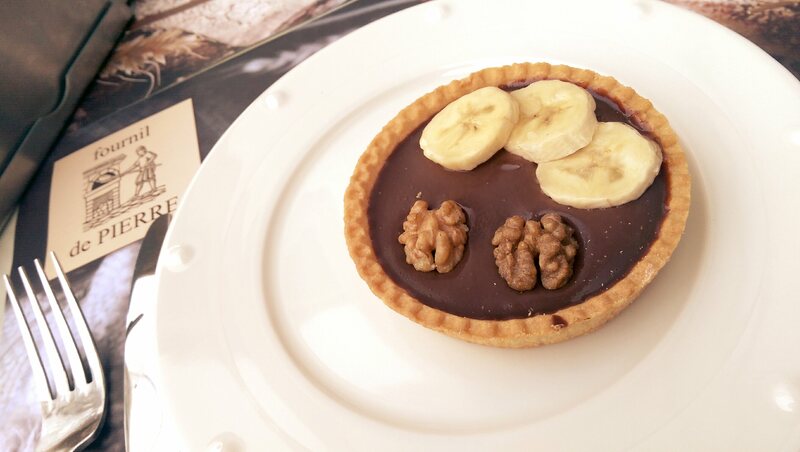 It took them seconds for them to serve the dessert but had to wait say 15 minutes, staring at my chocolate tart melting before my coffee got served. The restaurant was not that full so I was expecting attentive and fast service so they need to be more careful on this one if they want regulars. The manager was kind enough to ask me if I needed assistance while I was picking my dessert in the display area or whatever you call it. Merci beaucoup. It was already 1pm so everyone was already ordering their lunch. Haven’t seen the menu but it was weird to see some dishes being served with rice. In a French restaurant? or I might be wrong. Will find out when I come back to try out their lunch or dinner menu. Overall? The place is great for casual get togethers with friends after the beach but there are better please out there with better service and excellent food. 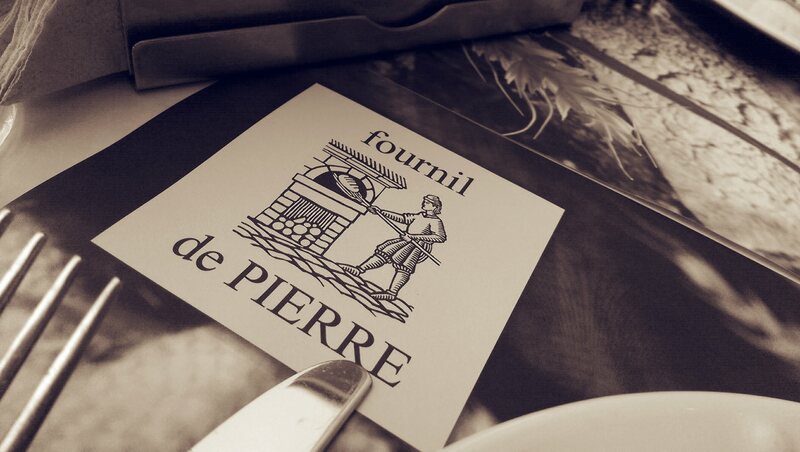 I will come back again for the third time to Fournil De Pierre if I am craving a full French lunch soon. We will see. I hope next time they already have complimentary newspapers and magazines for the customers. What’s cafe without them. We still need those small touches. Next Post Dubai: Piemonte Cuisine At Eataly!